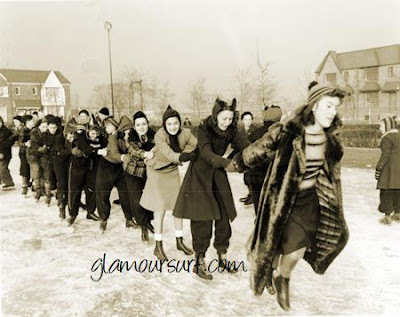 Continuing our 12 days of Christmas posts, today we'll look at ice skating. This weekend DH and myself went downtown to enjoy some culture, we had some nosh, and walked around Christmas in the Park until we came upon the downtown ice skating arena. They put this up every year for a limited time. I really tried to encourage DH to go ice skating with me but sadly for me, he wasn't going to have any part of it. I grew up in cold country, Wisconsin and Boston namely. 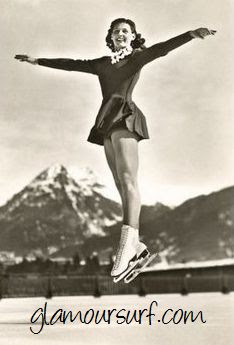 As a girl we'd always go ice skating through the woods or down at the local pond. 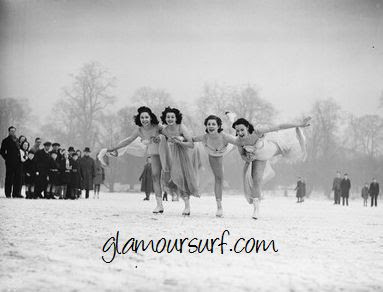 I have lots of fond memories of having fun with my friends and sisters playing in the snow and skating all day. 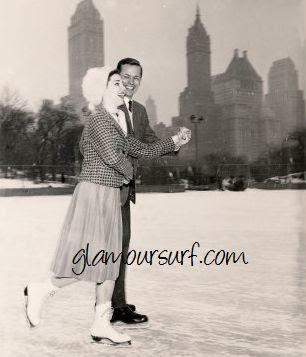 Ice skating is such a fun activity to do with a loved one or a friend or even by yourself. What a better way to put a smile on your face, get some exercise and have fun at the same time. Just look at these gals, aren't they beautiful. Of course they have ice skating costumes on while all the watchers look terribly bundled up. Twirls and jumps oh my. I've never been that accomplished but I sure can admire the talent of these ladies. 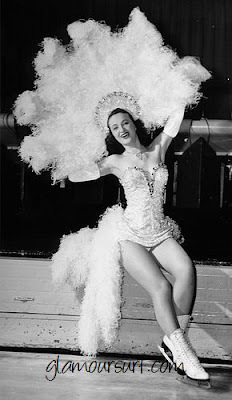 And checkout their beautiful costumes! 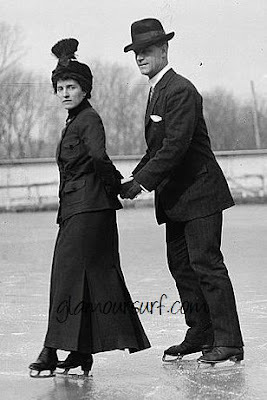 Ice skating is just a bit romantic when you have a partner in crime. Someone tolean against, keep you a bit warm, and help protect you from falling. 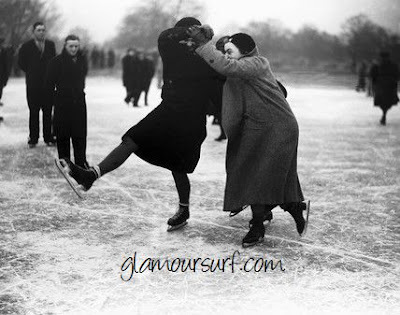 Dancing on the ice, ah, the memories. It just always makes me think of Christmas time. Doesn't she look daper in her hat and skirt? And if you prefer, there's always the indoor ice skating arenas where you can stay a bit warmer, but you have to go round and round and round again. 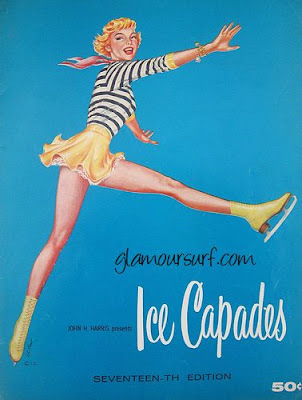 If you don't ice skate your self there is always the Ice Capades or dare I say, Disney on Ice shows to go see with the kids. Heck, we even have a professional hockey team locally and I love to go watch the guys make skating look effortless, all the while pushing around the small pcuk and getting very aggressive with one another. 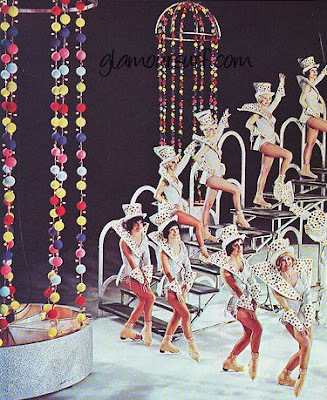 And oh the glamour of the old shows and movies you can watch where costume and beautiful girls sing and dance along. I love how many of the suits are similar to swimwear. I hope you take your friend or loved one out for a spin on the ice this season. It really does create some wonderful memories. Since DH won't go with me, I'm planning on asking my daughter next. How about you, do you skate? If you do and your small we have a cute skating style costume in our ETSY store here. Great pics! We have an outdoor ice skating rink here but it's actually made of plastic. Welcome to Florida! Well now, glad you have fond memories of the ice and snow!!! 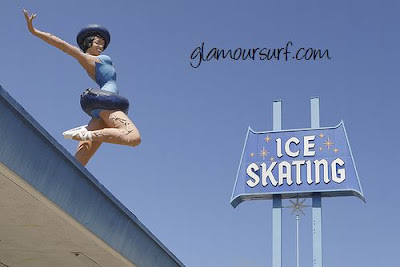 And your sister had a series of ice skating lessons within an indoor rink in Ca. I hope she sees your blog. Oh no, say it isn't so. 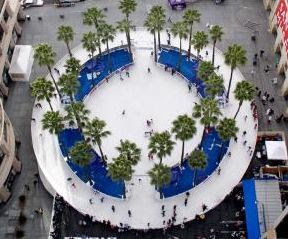 A plastic ice skating rink? There is just something not so right about that. Come to California! Puddin, which sister are you referring to, I have 4!? !